pring is slowly, lethargically springing, Easter is over, and we can all start looking forward to a day with six or more consecutive hours of sunshine and not eating root vegetables. The Farmers’ Market will provide its usual bounty of overwhelming edible glory, but don’t forget farm shares through local Community Supported Agriculture (CSA) farms! A farm share entitles you to pick up a weekly box of produce at your farm and take part in other activities your farm may offer. It makes the farmers happy, because they can actually plan on how many of which harvests they can sell, and it ensures you’ll get a full spread of the best of the weekly crop. 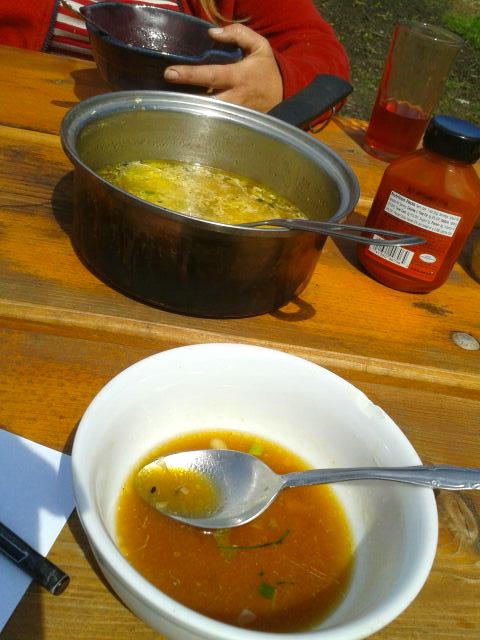 Garlic chive green onion soup. 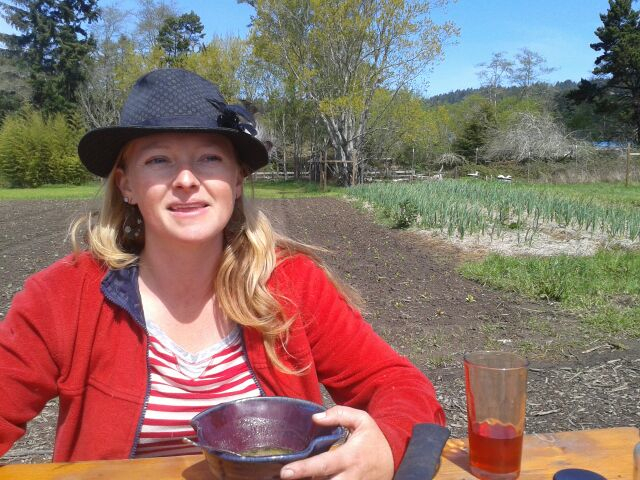 Bayside Park Farm on Old Arcata Road boasts an admirable fleet of goats and, during a recent open air luncheon, delicious garlic green onion soup. Farmer Jayme is looking forward to broccoli, kale chard, onions, cauliflower and later summer crops of tomatoes, pepper and eggplant. There’s also a “U-Pick” herb garden that will sport parsley, basil, cilantro, oregano, catnip, lemon balm and dill. To purchase a farm share, visit the farm or call ‘em up at (707) 822-7091. Farms shares are $450 for 21 weeks, which may be paid in two installments, or split with a buddy. Every week you just bike, hop or skip over to your farm and pick a box of literally the freshest vegetables possible. Over at DeepSeeded Community Farm, Eddie Tanner grows a wide variety of yummy veggies on offer for farm share purchase. Lettuce, spinach, peas and broccoli will be going all summer, and having lots of greenhouse space allows Eddie and his crew to add tomatoes, peppers, eggplant and melons to the mix. Other crops coming include, but are not limited to, arugula, basil, beans, beets, bok choi, celery, cucumber, fennel, garlic, leeks, onions, potatoes, radishes, squash and sweet potato. Praises have been sung over the fully ripened strawberries! DeepSeeded’s 36-week CSA harvest season is beginning in less than two weeks; it also offers U-Pick Flowers, raspberries, and a kids-only Strawberry Patch as part of the package. Well put, sir! Check the DeepDeeded website for registration and details. Janet Czarnecki owns Redwood Roots Farm, which offers not just veggies, but educational opportunities. Field Internships run in spring and summer, and their Farm to School Program offers field trips to the local town-bound schoolkids. They’re in the middle of their Spring Share now, ending in May. The Main Season Share runs 22 weeks, from mid-June through October, and offers the full complement of what’s grown, from veggies to flowers to herbs and berries. They grow all the usual green staples along with apples and strawberries, as well as “seasonal specialties.” If you prefer home decor to cooking, they also offer a Flower Share from July to October. redwoodrootsfarm.com, and they can be phoned at (707) 826-0261. We’re blessed around here farmshare-wise; there’s also Luna Farms, Green Fire Farms, Earthly Edibles, Neukom Family Farms and more. Check duhc.org/page/community-supported for a good listing. Meaty, meaty, delicious meat. Full of grilled meat meatiness. With the exception of about one-third of Arcata, who doesn’t love meat? 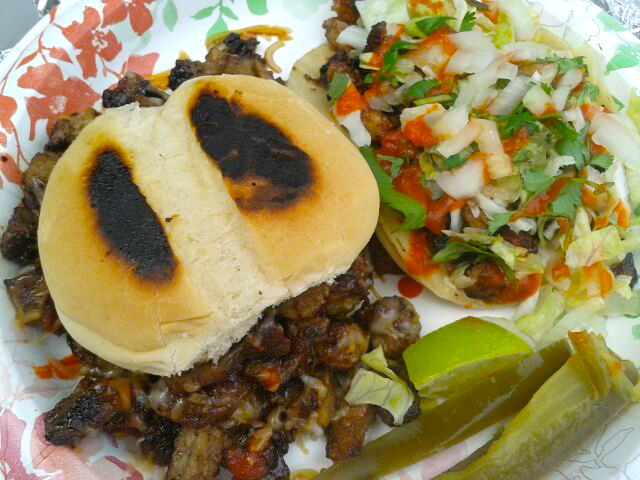 If there was a place that had sliders chock full o’ pork or beef for two bucks, wouldn’t you want to know? Now imagine said meat bedazzled with the delicious salty-sweet taste of rich garlicky Korean BBQ sauce and mounded like a oniony breast on a grilled roll. Or perhaps you’re down to the change in your sofa cushions? The same abundant juicy goodness can be had for only a dollar-eighty, smothered in fresh cilantro-y pico de gallo and drizzled with hot sauce. Pickled jalepeños are optional. The frosting on the meat cake is the friendly proprietor Armando, who loves being nice to customers as much as he loves grilling. This entry was posted on Wednesday, May 1st, 2013 at 4:34 pm	and is filed under News, Community, Scene. You can follow any responses to this entry through the RSS 2.0 feed.